Jordan Ingram reporting for FishDuck.com at the NCAA Eugene Regional at Howe Field in Eugene, Ore.
After a slow start, the No. 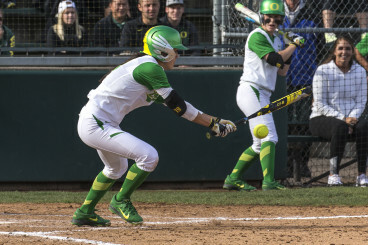 2-seeded Oregon Ducks (47-6) softball team eventually found its fury in front of a home crowd, steamrolling BYU, 8-0, in a run-rule victory Thursday evening. 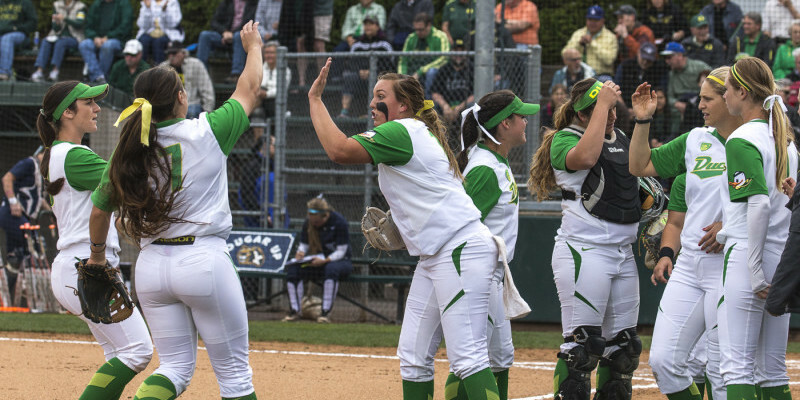 The Ducks’ win wrapped up the first round of the NCAA Eugene Regionals at Howe Field. The four team double-elimination series continues Friday as Oregon will face North Dakota State, who defeated Fresno State, 4-0, earlier Thursday afternoon. The Ducks scored in the 1st inning after Janelle Lindvall was hit by a pitch with bases loaded, walking in a run for a 1-0 lead. But the Ducks wouldn’t score again until the bottom of the 3rd when Geri Ann Glasco’s RBI single scored Hailey Decker, putting the Ducks up, 2-0. While the Ducks struggled to kickstart their potent offense, the BYU bats were no match for lefty ace Cheridan Hawkins, who protected Oregon’s shaky 2-0 lead. Hawkins’ three-up, three-down in the 1st inning was a good indication of things to come, as the two-time Pac-12 Pitcher of the Year held a no-hitter through 4 innings. The Cougars finally made contact, ending a potential ”no-no” with a double to right field to start the top of the 5th. Janie Takeda sparked the Oregon offense yet again, leading to a 8-0 rout of BYU. 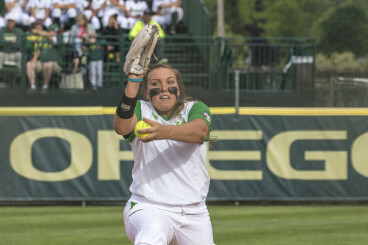 But the “Hawk” proved her pitching prestige, shutting down a potential momentum shift with two strikeouts to end the inning and preserving Oregon’s delicate margin. The Ducks’ All-American pitcher threw a shutout with a master’s touch, serving up a devastating rise ball that kept the Cougs mystified and off the scoreboard entirely. In the bottom of the 5th, senior Janie Takeda’s single awakened a dormant Oregon offense. The Ducks new career leader in hits, stolen bases, and runs scored, tallied one of each as she stole second base to put the Ducks in scoring position. Hawkins dominated BYU from the mound, pitching a no-hitter through four innings. Takeda scored on Glasco’s RBI single up the middle, giving the Ducks a 3-0 lead with bases loaded. Koral Costa ripped off a two-RBI double down the leftfield line, giving the Ducks a convincing 5-0 lead. Nikki Udria followed suit, sending another line drive up the left line for another two-RBI double. Oregon scored five runs on four hits and finished the 5th inning with a 7-0 lead. Hawkins iced three straight batters in the top of the 6th to finish the game with 12 strikeouts. and USA Softball Player of the Year finalist is throwing at the peak of her game, providing her team with time to find an offensive spark. The Ducks will face North Dakota State today at 11 am at Howe Field, as the NCAA Eugene Regionals continue through Saturday.